Thank you for taking part in the 2017 Creativity in PR survey. Please note that your survey responses are anonymous, unless you inform us otherwise. 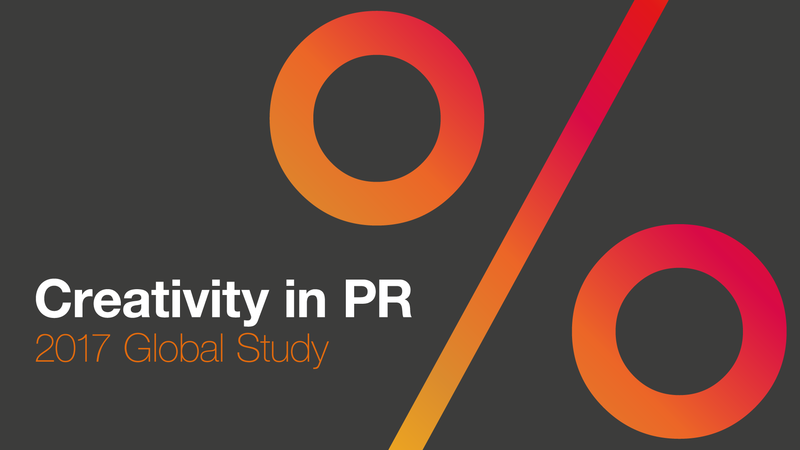 We believe that the development of creativity in the PR industry is worth charting, and the responses we have received during the six years of this survey's existence would appear to bear this out. So we appreciate your candour and time. A note on definitions: in previous years we've asked respondents to define creativity (possibly not our smartest idea) and we've been asked to define it ourselves. As Creativity In PR co-author Claire Bridges notes "creativity in any domain is a notoriously tricky thing to define," especially as there are hundreds of definitions out there. The ability to outthink the competition, rather than simply outspend them (earn it). The novelty or ‘newness’ of the idea. The emotion that the work stirs, particularly vs a purely rational argument. The influence and impact (recommendation, media coverage, fame) delivered by the creative work. The value of that influence and impact (profit, behaviour change, enhanced reputation). Context is also important. In the cultural context of the consumer frenzy of the biggest trading day of the year - Black Friday - US retailer REI's bold #optoutside campaign ensured that the brand stood out amongst a sea of sameness. A pop up restaurant to promote a food brand is nothing new, but when it's serving up bugs to promote Rentokil's B2B pest control services like the award-winning Pestaraunt or a Walkers crisps sarnie cafe hidden speakeasy-style in a newsagent, the context changes the way we view the idea. * 1. In which region are you based?